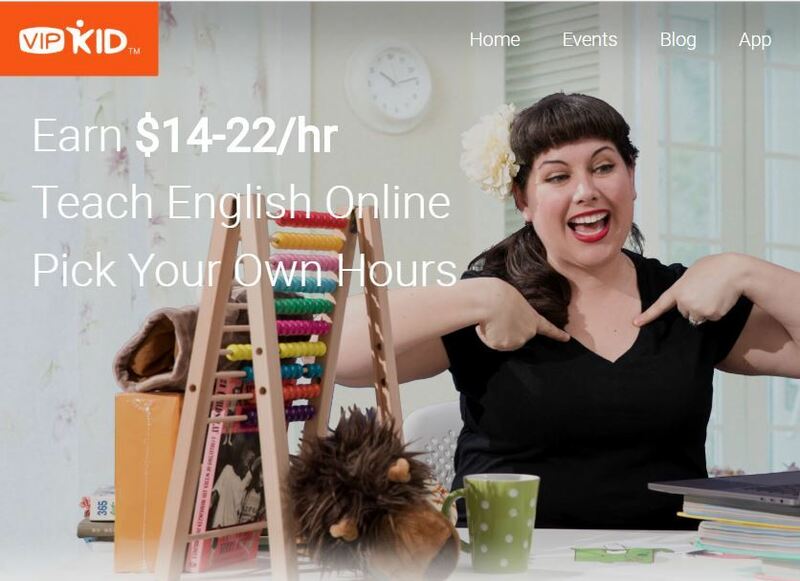 →Is VipKid a Scam Or Will You Make $19/h? Read Before Starting! Welcome to my VipKid to review! If you're looking for the most trusted way to earn money online as an English teacher, you have arrived to the right place. In this review, I will show you exact steps that you will need to take the started earning money on VipKid as soon as possible. To the initial question on the title, "Is VipKid a scam?" The answer is no. As you will find out further VipKid is one of the biggest English teaching platforms in the world right now. In addition, they are hiring new teachers right now. Summary: VipKid is one of the biggest and the most well-known English teaching companies online. +40,000 teachers are making money through their website by teaching English and they have +300,000 students. Is VipKid Recommended? Yes, if you are looking for a flexible work from home job with your own schedule, VipKid is a great option for you. The salary is not huge but $18/hour with flexible hours is not very bad either. NOTE: Teaching English is an easy way to make money online but the downside is that you will not make passive income. Therefore, the income on VipKid is limited to ~$22/h. 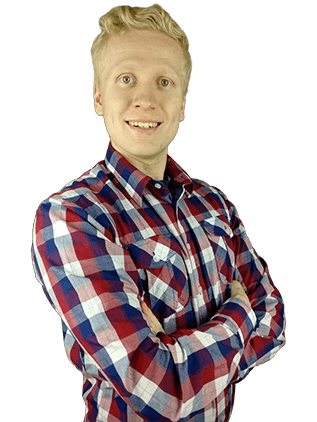 If you are aiming for +$10,000/month income from home, I recommend going through my #1 recommended step-by-step training. I will also personally connect with you to help you further and I am available for all your questions. In order to provide you with the most comprehensive information on VipKid, I also created a YouTube video where I explain you the most important details on earning money on VipKid. Watch my video until the end and let me know if you have any questions. I will be happy to help you to start earning! VipKid is a company that connects North American people who want to teach English and Chinese kids who want to learn it. The company was founded back in 2013 and it been the fastest growing online English teaching company in the world with over 300,000 students as end of 2017. In 2018 to company has hit even more records. An interesting detail about VipKid is that backed by world-famous basketball player Kobe Bryant and other venture capital investors like Learn Capital, Tencent, Sequoia Capital, Matrix Partners and many others. VipKid is the official provider of the TOEFL Primary assessment in China. Most of the students are 4 to 12 years old children from the middle class families in China. VipKid is a reliable company/platform to work for. Tired of strict 5-jobs? Want to spend time with your kids or friends? No problem! On VipKid, you will be able to set your own schedule and work whenever you want. I have been working from home full-time now for over a year and I now from my own experience that it's great because nobody says when you should or shouldn't work. You can also spend time with your kids or take a day off if you want. Everything is up to you. ​VipKid provides also the flexibility to your location because you can completely choose where you want to do the teaching. ​As long as you have the Internet connection, you are good to go. Teaching on VipKid has several benefits. VipKid has created a unique and easy to follow curriculum for teachers to deliver English classes on the Internet in a 1-on-1 environment from the comfort of their homes. In addition, you don't need to spend any time grading your students like in a traditional teaching job. That makes your teaching gig even more flexible and easier. We have reviewed more than 450 make money online opportunities on YourOnlineRevenue.com. 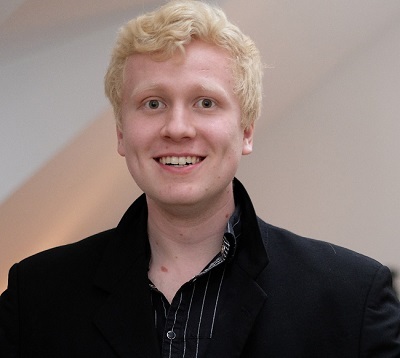 However, many of them have been low-paying websites that I can't honestly recommend. 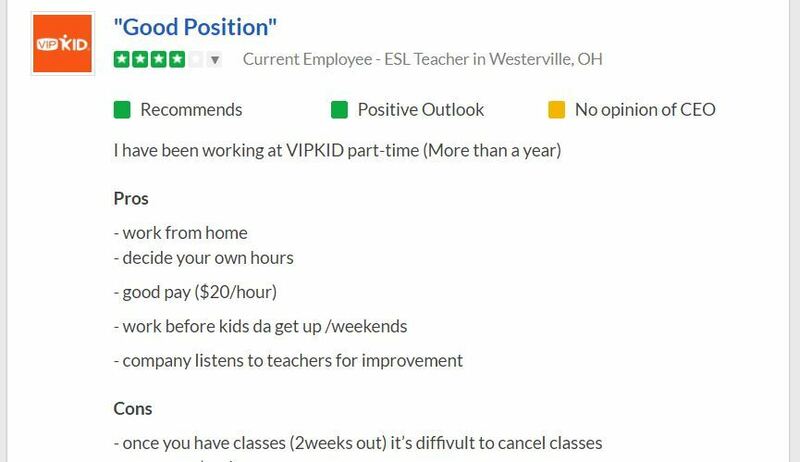 Gladly VipKid is a better one because they are paying a good salary for their teachers. As I will explain you more in detail further on this article, the average teacher earns $19 per hour on VipKid. That being said, the salary is good but you will not make +$10,000 per month income if you are aiming for such an income, I recommend following this step-by-step training that took me from a complete beginner to a good money online and traveling around the world. Based on hundreds of VipKid teacher reviews on the Internet, most teachers find teaching fun and VipKid community very supportive. Take a look at the video below to learn more about teaching on VipKid. You must be from the United States or Canada. You must have a Bachelor's degree. Pretty simple, huh? If you fill out those requirements, you are ready to start the application process that I will explain you in detail in the following chapter. Below are also listed the technical requirements of teaching on VipKid. Desktop computer, Laptop or Mac with the Internet access. Many teachers say that teaching on VipKid is like being on an interactive Skype call with Powerpoint presentations for lesson plans. Remember that you don't need to create any lesson plans yourself. The curriculum is created by the VipKid Curriculum team which takes all the pressure off the teachers. Therefore, you can just focus doing on what you enjoy - teaching English - without any extra preparation work! The platform that you'll be using is VipKid's proprietary tech and curriculum developed in-house.It's VipKid branded product from start to finish to make teaching for you as convenient as possible. No communication required with parents - VipKid team is in touch with the parents. In this chapter, I'm going to explain you the simple 5-step application process on VipKid. Sign the contract with VipKid. (6.) Start teaching kids and earning money! The application process is simple and easy to follow. VipKid team is also very helpful, supportive and will answer all your questions regarding teaching. If you have any questions or concerns, I recommend that you start the application process here and ask from the team when they contact you. Your monthly salary on the VipKid will depend on how many hours you want to teach. 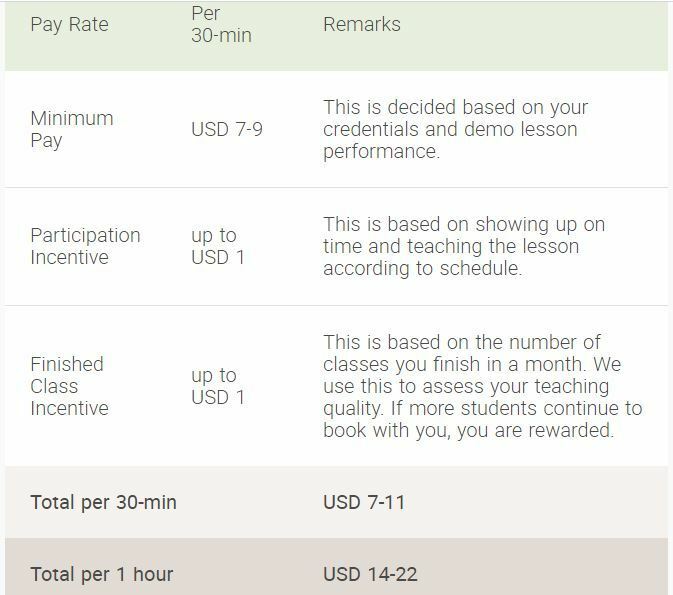 Teaching on VipKid is very flexible and you can set your own schedule.The average earnings that VipKid teachers are reporting are $19 per hour. The image below illustrates you how the salary is set on VipKid. All the lessons are 30 minutes long and can possibly earn $11 for each 30-minute lesson. Therefore, you can also calculate your monthly salary. You can comfortably earn more than $3,000 per month on VipKid if you give lessons regularly. That being said, ALL those benefits apply also to my #1 recommended way to make money online which is WAY more profitable than VipKid. 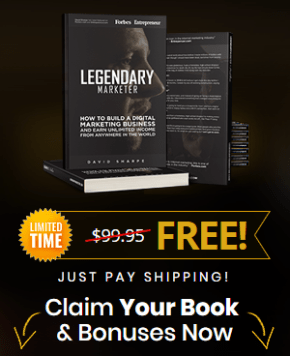 Learn more by reading my Ultimate Make Money Online Guide now. There are hundreds and probably even thousands of teacher reviews on the Internet. A big majority of those reviews are positive and most of the teachers enjoy teaching on VipKid. They embrace the flexibility of the VipKid opportunity and the friendliness of the community. This is a very typical VipKid review from teacher's perspective. Notice that many work from home online jobs don't pay $20 per hour like VipKid does. Below you can also see reviews from Rachel, Stephanie and Donna on VipKid's own official website. Almost all teachers enjoy teaching on VipKid. One of the most frequently asked questions regarding teaching on VipKid is, "Do I need to prepare material for my lessons?" VipKid curriculum team has prepared material for every class so no extra preparation is required from your side. Of course, it is recommended that you review the class material before your lesson so you know what you will be teaching about. You will be always able to preview the class materials in the VipKid's teacher portal before your lesson. VipKid's goal is to make the process as easy as possible for all their teachers. That's beneficial for you, a child (student) and VipKid as well. Conclusion - Is VipKid Worth It? If you want a convenient and flexible opportunity to make money from home, we pick it is for you. Many teachers say that they wouldn't even call this a "job" because teaching on the VipKid is so fun. It is just like having a Skype conversation with an interactive PowerPoint presentation that been has prepared for you. Of course, I need to mention that if your goal is to earn something like $10,000 per month from home, then this is not for you. For such an income you must follow this training. But if you are satisfied with the $2,000-4,000 income from home, then this opportunity would be great for you. However, you will not be earning passive income with VipKid which a huge drawback in my opinion. Check out my list of the most recommended online jobs to learn BETTER ways to earn money from home. To summarize the article, I have listed the frequently asked questions below. Just click the question to see the answers. If you have any other questions, you can always ask me in the comments below and I will be more than happy to reply you personally. How Much Money Can You Earn on VipKid? $14-22 per hour. On average teachers earn $19 per hour. What Are the Requirements for a Teacher? You must be from the United States or Canada and you need to have a Bachelor's degree. Yes. It is one of the biggest and the most trusted English teaching companies in the world right now. Do Teachers Enjoy Working on VipKid? Yes. There are hundreds of positive VipKid reviews on the Internet. Most teachers would also recommend the platform for other English teachers. When And How Are the Salary Payments Made? You will be paid through direct bank deposits between 10th and 15th of each month. How Long Are Teaching Classes? 30 minutes in total. 25 minutes active teaching time and 5 minutes available for comments and feedback. ​Do you have any further questions of VipKid? What kind of experiences do you have with VipKid? Start Making $19/h on VipKid Today!